In the process of forming a limited liability company, one of the most important things you'll have to decide is how the business will be managed. 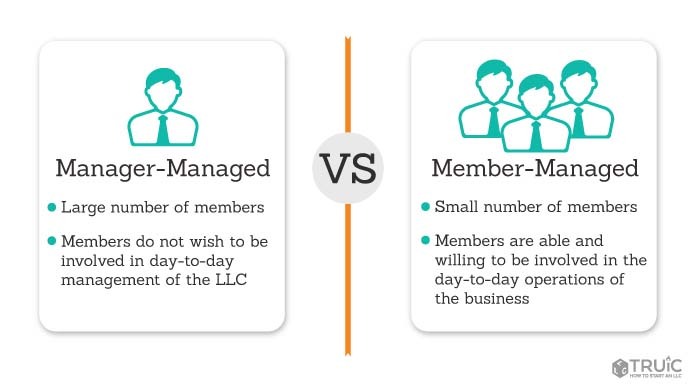 There are two basic management structures for LLCs: member-managed and manager-managed. What does a member-managed structure look like? In a member-managed LLC, the members are actively engaged in the operations of the company. Each member has a say in both day-to-day and big-picture affairs, and a vote is required for all major business decisions. This LLC structure is sometimes called "decentralized management" because the administrative power is dispersed among the members rather than being centralized in the hands of one or more managers. Married couple Michael and Melissa Thompson decide to start a bed and breakfast together. They wish to register the business as an LLC and share equal responsibility in running the company. Rather than hire outside management, they'd prefer to remain the only members, so Michael and Melissa opt for a member-managed LLC structure. What does a manager-managed structure look like? In a manager-managed LLC, the members recognize that allocating administrative power to one or more specific managers is a more efficient way to handle the day-to-day affairs of their company. Manager-managed LLCs do not require members to vote on all business decisions, but rather grant the managers authority to call the shots on their own. This LLC structure is sometimes called "centralized management" because the administrative power is centralized in the hands of one or more managers. Forty members of a religious community decide to open a local shop where they'll sell religious books, clothing, movies and other materials. Most of the members have full-time jobs, and none have experience running a business. For these reasons, they choose to appoint another member of the congregation to manage the business in exchange for an annual salary. In this case, a manager-managed LLC structure is the most suitable option. Choosing a management structure for your LLC is an incredibly important task, and one that you shouldn't rush to judgment on. How many members does the business have? What level of involvement are the members able to have in the day-to-day operations of the company? What rights and obligations do the members want in regard to big-picture affairs? Create a free account to download our operating agreement. Please keep in mind that this operating agreement is only intended for use as a reference. To download: After logging into your account, scroll through the tiles on the DASHBOARD page. Select "Free Legal Forms" and click the download icon beside "Free Sample Operating Agreement"
Many states have default rules that will automatically determine aspects of an LLC's management structure unless otherwise defined in the business' articles of organization or operating agreement. If you have specific concerns regarding the default rules of your state, consider hiring a local attorney to assist in the formation of your limited liability company.